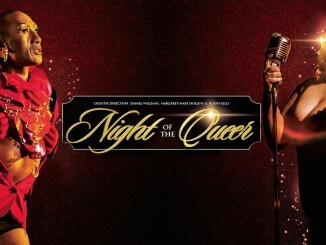 Night of the Queer is everything you’d expect in a cabaret-style theatre show and more. Having seen last year’s NOTQ, I arrive with excitement and anticipation as the super-friendly staff usher us toward our seats. A few members of the cast, dressed in beautifully fitted one-piece bodysuits, are scattered across the floor and spontaneously dancing, giving us a tasty teaser of what to expect. The set design (or lack of) is simple, but the lighting design and pre-show music immediately transports us into any cabaret-style bar. Under the direction of in-demand entertainers and dance theatre company Luck & Schooney, the dynamic duo James Luck and Rebekkah Schoonbeek have yet again created a sassy, sizzling and fun piece. Key word being FUN. 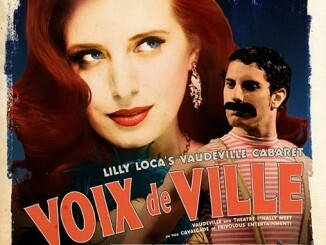 The show is a variation of gender-bending acts of burlesque, cabaret, circus, theatre, music and dance. The show highlights love (or queer love) and self-discovery with inspiration from Greek gods and goddesses, encouraging people from all walks of life to embrace themselves and what makes them special. There was a varied amount of performances and I often caught myself (and my friend) in awe of the amazing talent presented on stage. Highlights for me were specifically Rebekkah Schoonbeek (as Athene), James Luck (as Apollo) and lastly Ellyce Bryson (as Thea – the bride) who blew me away with her elegant aerial performance. Ben Channing (who played Tito – the groom) was stronger in a romantic duet near the beginning but lacked consistency in the large ensemble dance numbers leading into the finale. Schoonbeck (for me at least) stole the night with her show stopping dance performance in a fountain, splashing various colours of confetti over the stage. The roaring crowd reaction and sea of smiles in that moment was definitely the highlight of my night. I hope that in the future seasons of NOTQ, Luck and Schoonbeek consider more live singing – this has been a highlight of previous year’s shows but was absent this time around. 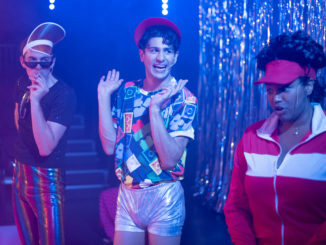 2019’s incarnation did however offer various lip sync performances as well as one spoken monologue and a rap verse (which was poorly performed live). Nonetheless, judging by the crowd reaction on opening night, all seems to be forgiven. Finally, considering the controversy around Auckland Pride this year and the serious conversations around queer representation, Night of the Queer reminds us it is okay to have a bit of fun and celebrate who we are. Night of the Queer is an opportunity to put on your 6’ heels, a bit of lippy and let down your hair. It is Fabulous, Underrated and Naughty – I leave the venue wanting more. Night of the Queer plays at TAPAC until 15 Feb.